Faraday Future and Evelozcity have been legally feuding for months. 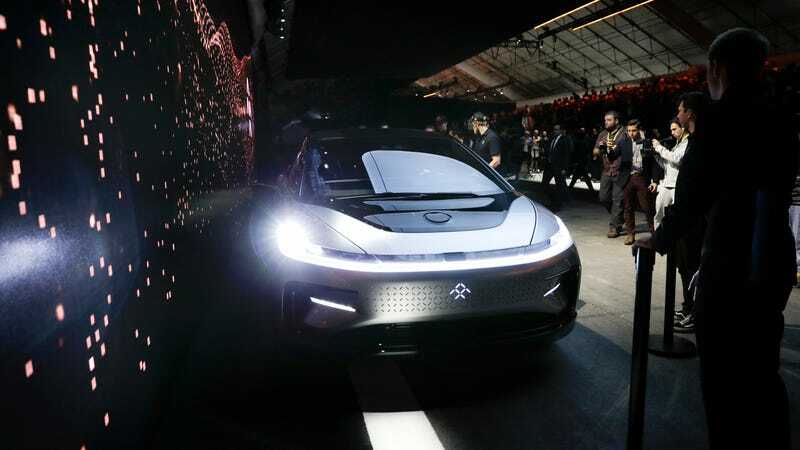 Even as electric car startup Faraday Future has been inching closer to making a production car, its ongoing legal skirmish with a former executive is continuing to get worse. On Thursday, the former executive’s new startup sued Faraday, claiming its employment agreements violate California state law by preventing employees from seeking work elsewhere. But the complaint also paints a harsh picture of day-to-day life at Faraday. Faraday’s rocky four-year history has been well-documented, but the 20-page complaint from electric car startup Evelozcity accuses Faraday of luring employees to the company on false promises and requiring them to sign employment agreements with a so-called “non-solicitation provision” that makes them ultimately feel reluctant to leave the company. Evelozcity’s CEO, Stefan Krause, has a loaded history with Faraday and its CEO, Jia Yueting. Faraday hired Krause in early 2017, as the startup was struggling to remain financially viable. Krause set out to raise $1 billion for Faraday’s project and lured Ulrich Kranz, another former BMW exec, to Faraday as chief technology officer. But despite speaking with more than two dozen possible suitors, he found no takers, Jalopnik previously reported. By October, he’d left the company. After Krause confirmed his departure to Jalopnik, Faraday issued an extraordinary statement, accusing him of “malfeasance,” and tried to claim that it, in fact, had fired Krause. The company later sued Krause, claiming he stole trade secrets and employees. Krause denied the allegations and that case is pending. Faraday didn’t immediately respond to a request for comment. Evelozcity declined to comment. Krause wanted to take Faraday into bankruptcy, but was ultimately shot down by Jia, and Evelozcity’s suit expanded on Jia’s position. Once there, they observed a number of alarming and disturbing realities that proved FF was far from the company that was originally represented. Instead of building a cutting edge technology company, employees routinely spent their days fending off calls from creditors and strategizing about which bills to pay to avoid bankruptcy. By the fall of 2017, FF regularly depleted its bank account and required infusions of cash on a biweekly basis just to make payroll, as the company had become both illiquid and insolvent. The alleged enforcement of Faraday’s non-solicitation cause has created a “chilling effect” in the small EV industry, Evelozcity alleges. “This chilling effect is particularly pronounced due to the small industry and limited number of alternate employment options available to these specialized employees, and is felt by the FF employees and EVelozcity, alike,” the complaint claims. The lawsuit asks for injunctive relief and a declaration that Faraday’s non-solicitation clause is unenforceable under California law.